Are you tired of riding your tricycle in the same old places? The tricycle hitch rack gives you the freedom to take your trike to any place that you want to ride. Most tricycle riders are limited to enjoying their ride close to home and they think that's just the way it is. This is not something that they have to live with any more. If you have a 2 inch hitch on your vehicle you now have the option of taking your tricycle anywhere you can drive. 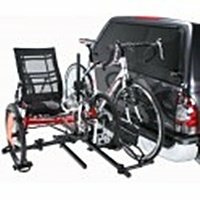 The Sport Rider Heavy Duty tricycle hitch rack can also be adapted to accommodate a bike and a tricycle or even a bike and a recumbent tricycle. And it is built sturdy enough to handle the load. The rack folds up when not in use, tilts down for easy cargo access and includes a keyed alike locking hitch pin and security cable. Features patented “no wobble-no tools” hitch tightening system. For 2” hitches only. The following video shows just how versatile this tricycle hitch rack really is.